Hi all! It’s hard to believe that in just a week we will be celebrating the 10th anniversary of the PlayStation 2 system. Today, we’re very excited to announce the availability of a new, limited edition Toy Story 3: The Video Game bundle for the PlayStation 2 system on October 31. 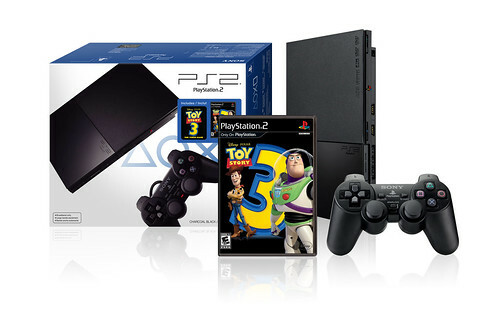 Available nationwide at participating retailers for $99 (MSRP), this new bundle combines the PS2 system with Toy Story 3: The Video Game, which lets players help Buzz, Woody and the rest of the Toys ensure no toy gets left behind. Nearly 10 years since it first launched, the PS2 continues to be a force in gaming and to date is in more than 146 million homes worldwide. At $99, the PS2 provides great entertainment value for new gamers and families with its built-in DVD player and a deep library of more than 2,000 games. Be sure to mark your calendars for October 31 and enjoy! you know, i wouldnt mind buying a brand new ps2 bundle.. but i would want the one with the hard drive so i could run ffxi and eqoa..
speaking of any chance SOE considering an Everquest Online Adventures Sequel? Wow, that is really cheap. This is the only console from the last generation to still be selling, and with good reason! Glad you feel that way; we are really proud of the PS2. With that said I see your point in running the PS2 untill it has nothing left to offer the public. This is the last hurrah for SCE really. No really, is nintendo still selling gamecube? NO is microsoft still selling the original Xbox? NO. both were discontinued when the Wii & 360 hit store shelves. New releases have predictably dwindled to nothing worth mentioning, rental stores ditched it years ago. Most retailers keep a bare minimum of stock on PS2 systems, accessories & games for one obvious reason, ITS NOT SELLING! Its long overdue that Sony dropped the ball bad in more than one way here. they could’ve developed a software emulation on PS3 that would’ve been debugged and out by now if they knew which way was up. And it could be sold on the PSN store and made more revenue than ps2 hardware is generating now. At least the PS2 doesn’t break down all the time like the PS3 lol. That’s a pretty nice bundle. I already have a Ceramic White and Satin Silver PS2 Slim, but I don’t think I need a third. Any idea if this will come out in the UK at all, Ami? I’ve been hunting for that model for over a year now and no look – please help, nobody stocks it in this country any more and I’m sure people would love a comeback! Oh and Toy Story 3 is a great game on PS3. I love it. This should REALLY come with a memory card. Congratulations PS2 and all PlayStation users! (specially the ones who had the MAGNIFICENT PS2!) Now, a very cool present from Sony would be the backwards compatibility… Yay! Software emulation coming…!!! Right…? While I’m certain that this bundle will sell a respectable amount, it’s clear that the people that read this blog are not its target audience. when can we play PS2 game on the PS3 that would make me want to buy some of the great PS2 hits…. ps2 is a great system if they can make a toy story 3 game bundle still why did they not release god of war 3 for ps2 or atleast god of war something for its last years come on i want another god of war for ps2 being i dont own a ps3 make something please besides toy story. The Ps2 system is still selling well and Sony has every right to keep on marketing it. Wow 10 years went by quick! I don’t know why u say the PS2 is for kids and families only, i’m 30 and i’m planning on buying the bundle for myself, I have a still functional fat PS2, a BC PS3 and why am I still buying this bundle? cause i have a lot of PS2 games I haven’t played like the SMT Persona, Nocturne and Digital Devil Saga and a lot other cool non kiddie or family games I haven’t even opened yet, so I want to have a replacement PS2 for when my old one dies on me! It is great that Sony keeps all there video game consoles alive for 10+ years. I bought my PS2 in 2008 when they released the Lego Batman bundle and Im lovin it. In just two years I have purchased over 30 games for it. In my opinion the PS2 is the greatest video game console ever created. The PS2 has all kinds of games for everyone. They are the first to bring a motion capture devise to the video game world (eye toy). My favorite games on the PS2 are the arcade collections like Midway arcade treasures 2. For those of you that doest understand why Sony would put out a new PS2 bundle let me tell you why. Its to give people a chance to play a great system for a cheap price and you get a free game. an excellent value! I for one would rather pay $99 for a video game system then $300. I just don’t understand why so many people don’t appreciate why Sony keeps there video games systems alive for 10+ years. Sony keep the PS2 going and make some more first party games. Long live the PS2. I have a 100+ PS2 gaming library, with a 40 game backlog – WHY would I even consider buying a PS3 – a machine that can’t play any of them?. . . I’ll buy this new bundle as a backup. I’m actually going to get this one, I have been looking for a new PS2, I still have my fat one from 2000. It works well with DVDs but it doesn’t read those blue CDs as well as it used to. Maybe getting this one will let me play all my great PS2 games and will let me play some of those Blue disc games like Half-Life! I also like collecting PlayStation games and systems so this one is perfect since it marks a decade of PS2! Congratulations!